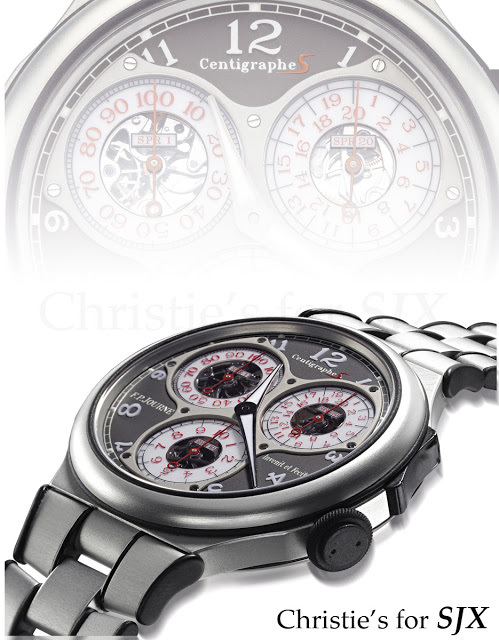 An FP Journe Centigraphe Sport to be sold on May 30 at Christie’s for charity. This is the first of a new line of ultra-light, sports timepieces from FP Journe. The watch is entirely aluminium, case, bracelet and movement, giving it a weight of only 55 g. The crown, pushers and sides of the bracelet are coated in rubber to absorb shock. According to Journe the aluminium alloy used is “scratch resistant… [with] anti-corrosive and anti-allergic properties.” This is good news as past attempts to use aluminium for watch cases, by IWC and Bulgari for example, were not notably successful given the softness of aluminium. I am still not sold on the aesthetics of the Centigraphe Sport. It reminds me of the Swatch aluminium. 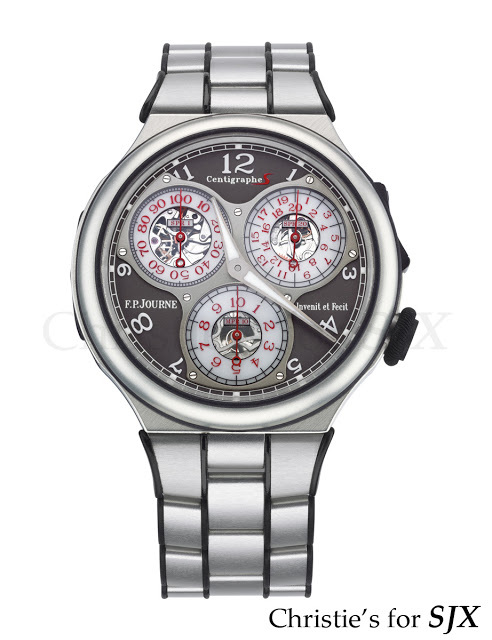 But given FP Journe’s track record with extremely elegant designs I’m inclined to give him benefit of the doubt. But more significant than the Centigraphe Sport itself is the fact that it will be the first model in an entirely new FP Journe collection, the Sport Line. According to the press release: “[The Sport Line is] a collection of new watches of an astounding lightness, thought and conceived specifically for a proficient sportive activity, and that will include watches with manual as well as automatic winding. Serial no. 001 of the Centigraphe Sport will be auctioned on 30 May by Christie’s in Hong Kong as lot 2192A with all proceeds going to Japan tsunami and earthquake relief. The donation ceremony, as well as the official launch of the Centigraphe Sport, will be held on 1 June at the Swiss Embassy in Tokyo.